Circles on Google+ present excellent people sourcing capabilities. Without looking closer, you may at first think that circles are like groups on LinkedIn, or maybe like lists on Twitter, but they are not. The interesting thing about circles is that only you, the circle creator, know what any circle is about and how you have named it. “Outsiders” can see a list of everyone in several of your circles together, even if your circles are public. You can add people to circles who are not on Google-plus, by adding their email addresses. Only you will know about this inclusion, until those people warm up to joining. 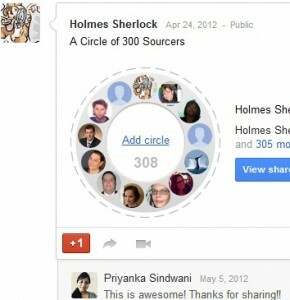 Google-Plus is very happy if you “share” news with a circle containing those non-member emails. It will mass-email notifications on what you had shared, plus, will invite these people to join. Obviously, this can serve as a way to deliver a link to a job post to a list of emails. As always, we need to select those, to whom we email, with care. So, Google-plus is happy to email large numbers of people who are not members. But it will not let you email your sharing notification to more than 100 members (guess, why?). Therefore, to share with Google-plus members with a notification, create circles with fewer than 100 members. Using Google+, you can “share” not just a link but you can also “share” a circle. Those with whom you share will then see everyone who’s included in the circle, sans email addresses of outsiders and the name of the circle. Here is an example of a shared circle. Some sourcing techniques may be based around existing publicly shared circles of experts in your target area/industry. Circles that have been shared publicly are not hard to find. In Part 2 I will talk about finding people for your circles. P.S. I’d say Sourcers can safely ignore yet another announcement, posted today, about Google’s semantic search (unless we need to source for celebrities). If you are curious, see Introducing the Knowledge Graph: things, not strings.